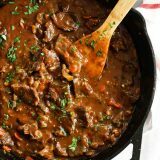 This Smothered Beef Tips Recipe has beef that is cooked in a homemade gravy until it is super tender and flavorful. Serve over mashed potatoes, rice or noodles for the perfect Sunday supper that the whole family will go crazy over. Cut the beef chuck into small strips, about 1 to 2-inches in length and 1/4-inch thick. Season generously with salt and pepper. Preheat a large cast iron skillet over medium-high heat. Add 2 tablespoons of the oil and swirl to coat the skillet. Add half of the beef and cook, turning halfway through, until browned on both sides, 5-6 minutes. Use a slotted spoon to remove the beef from the skillet into a bowl, then sear the remaining half of the beef. Decrease the heat to medium and add the remaining 2 tablespoons of oil. Add the onion and cook until it starts to soften, then add the celery and carrot and continue to cook, stirring often, until softened, about 5 minutes. Add the garlic and cook for 30 seconds, then stir in the tomato paste. Add the flour and stir through, until no dry flour remains. Slowly start whisking in the beef stock. Bring to a boil, stirring constantly and scraping up all of the browned bits from the bottom of the skillet. Reduce the heat to medium-low. Return the beef to the skillet, along with any juices that have accumulated. Add the bay leaf, thyme, and stems of parsley. Put a lid on the skillet and simmer, stirring occasionally, until the sauce has thickened and the beef is tender, 2 1/4 to 2 1/2 hours. If needed, cook uncovered the last half hour to get to your desired thickness. Discard the bay leaf, thyme and parsley stems. Stir in the red wine vinegar and minced parsley. Season to taste with salt and pepper. *I usually just have beef broth on hand, but did specifically buy beef stock for this recipe. You could probably still use beef broth, but I liked the extra richness the stock brings.